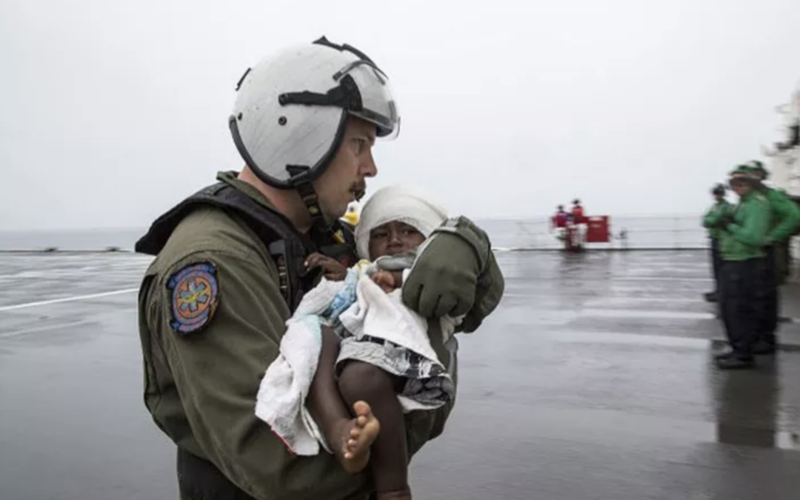 Navy helicopters crews, medics and rescue swimmers were all part of a harrowing rescue of a mother and her 18-month old little girl who clung to debris while drifting in the ocean after being lost at sea off the coast of Papua New Guinea. “A mother and her baby clung to the remnants of a boat and drifted for more than 24 hours,”a news report from Radio New Zealand International said. The mother and her 18-month old girl were among a group of teachers traveling to the Carteret Islands from Buka, an area on the northern portion of Bouganville — an island area off the coast of Papua New Guinea, the radio report explained. The group was planning to travel about 86 miles to their jobs on the Carteret Islands when their boat took on water and sank during refuelling, the report said. The mother, her toddler and at least four other mariners aboard the boat were saved June 30 by Navy rescue teams including an MH-60S Sea Hawk from a Navy hospital ship which was in the area, the USNS Mercy. The mariners were picked up on a small land mass called Han Island, an area off the coast of Carteret Island in Papua New Guinea, Navy officials said. The manager of Bougainville’s Disaster Office said the mother and her 18-month-old drifted for about 30 kilometres before coming ashore, the New Zealand International radio report said. “It was an emotional moment to receive the infant from the helicopter crew, knowing that she had been stranded at sea for over a day and we were concerned that she had developed a lung infection. To have her cry and show signs of good health right away was reassuring,”Capt. Melanie Merrick, medical treatment facility commanding officer, told Military.com in a written statement. Upon arriving on the scene, Navy rescue helicopters determined that the poor structure of the buildings on the island would not allow them to land. As a result, a Navy search and rescue medical technician, HM1 Matthew Hawkins, was hoisted down onto a sandbar from the helicopter. Hawkins then found the survivors and called back to the helicopter via radio to report his location while administering medical aid to the mariners. “It is pretty amazing to be able to put my training and hard work to use. I’m honored when I am able to help, but it’s funny to say that I hope I never have to. These types of rescues are not possible without a highly trained and effective crew chief,”Hawkins told Military.com in a written statement. After providing initial medical care, Hawkins signaled for the helicopter to send down a rescue basket and swimmer to hoist up the first survivors. The survivors were then lifted up to the helicopter one by one in the rescue basket, Navy officials explained. Hawkins came up in the rescue basket with the 18-month old girl, helicopter pilot Lt. Julie Froslee told Military.com. “I hope no one finds themselves in such a situation that they would need to be rescued, but I feel honored to be called upon when they are,”she said in a written statement. All of the survivors were immediately brought to the USNS Mercy for medical treatment. While Navy officials said they could not comment on the particular medical procedures performed on the rescued mariners, they did detail the kinds of activities which typically accompany a rescue like this on board a hospital ship. “Once patients are onboard Mercy, medical providers initiate full evaluations, clean open wounds, give intravenous fluids to treat dehydration and provide warm blankets to treat hypothermia,”Navy 7th Fleet spokeswoman Lt. Miranda Williams said. Williams added that lab and blood tests are also conducted to evaluate for signs of possible infection or electrolyte abnormalities that can occur from drinking sea water. Chest X-rays are typically done to check for lung injuries from inhaling sea water and EKGs are done to test for cardiac problems, she said. “The journey these poor people had to make just to survive truly amazed me. It was the least we could do to help them the rest of the way to safety,”said AWS3 Rescue Swimmer Erik Courtney in a written statement.